This year’s Decadence brought one of the biggest New Years parties in the world to Chandler, Arizona. What made this year special wasn’t the stacked lineup or the countdown to midnight. What made this year special was the connection between the artist and the crowd. Madness erupted from each set and you could feel the energy throughout Rawhide Event Center. Decadence Arizona continues to be the best place in the world to close out the year. Featured artists like Marshmello, Skrillex, Eric Prydz, and Porter Robinson made this year’s Decadence one to remember. As you walked through the entrance, lines seem to be much shorter than other events at Rawhide. This was due to offsite ticket pickup and a variety of VIP options. Cold weather ensued and stayed in the forecast for both days but, this didn’t stop people from bundling up and enjoying the NYE celebration. Three incredible stages awaited you as you walked into Rawhide Event Center. Diamond Atrium was the mainstage featuring acts like Rezz, Skrillex, and Marshmello. Sapphire Ballroom hosted a variety of different producers like Drezo, Valentino Khan, and Gryffin. Meanwhile, Ruby Courtyard brought local acts to the pedestal bringing their new sounds to life. We first checked out GG Magree at Diamond Atrium to get ourselves acclimated for the weekend. Her dubstep and trap heavy mix was followed by Dr. Fresch’s deep dubstep and groovy house set. After Dr. Fresch, San Holo brought his vibey bitbird sounds to Diamond Atrium who was succeeded by none other than, Skrillex. He brought his well anticipated music to Arizona with a fantastic set of trap and bass. It was for many, a long time since people have seen Skrillex since his Mothership Tour. Everyone was excited to see him back on the decks. 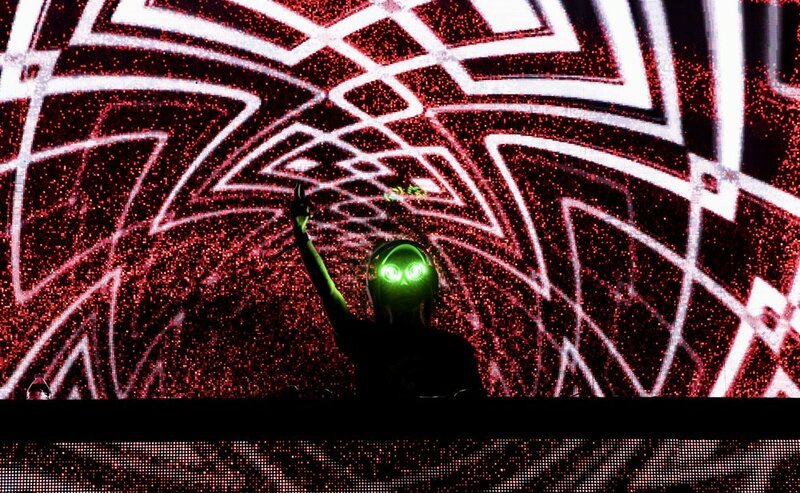 After Skrillex, Rezz took everyone’s souls as she usually does and Porter Robinson brought them back with his tracks “Divinity” and “Language”. To avoid people traffic, we left Porter Robinson early to catch the end of Drezo at Sapphire Ballroom. I was absolutley blown away by the sounds Drezo was putting out. Definitely an artist to keep an eye on in 2019. Skism B2B Trampa and Valentino Khan ended the first night with heavy trap and dubstep to paved the way for the acts performing the next day. The last day of the year at Decadence was unbelievable to say the least. Although rain was in the forecast, this didn’t keep people from experiencing the best night of the year. Many of the upper tier artists were featured at Diamond Atrium for the eveneing. My New Years Eve journey started off at Diamond Atrium with Alison Wonderland. She brought the crowd off of their feet and played tracks from her album “Awake”. Marshmello was after and had one of the best sets of the weekend playing his familiar tracks “Alone” and “Happier”. Ghastly then took control of the crowd playing his tracks “Control” and “This Song Scares People”. House of Hearts had a pleasure catching up with Ghastly in an all exclusive interview here. At 11:30 and drawing closer to Midnight, DJ Diesel took stage for thirty minutes and both Nghtmre and DJ Diesel counted down the final seconds to midnight and brought down the house with the heaviest dubstep/trap heavy set I’ve ever heard. Gryffin and Eric Prydz ended Decadence with lower BPM to settle the insanity of the two days. It’s safe to say that this year’s Decadence brought the people of Arizona another amazing event to remember at Rawhide Event Center. Relentless Beats did a terrific job organzing this New Years Eve event, making things easier for every concert goer. Be sure to keep an eye out for another incredible lineup Decadence will drop in the near future.